Today sees the launch of the yoximo mobile payment terminal, which represents a technological advancement for SIX in the field of mobile terminals for cashless payments. 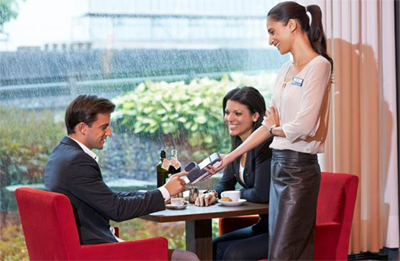 One of the device’s practical features is that it is the first payment terminal in Switzerland to be able to automatically switch between a mobile and Wi-Fi connection. SIX Payment Services is launching the yoximo mobile payment terminal featuring state-of-the-art technology across Europe, replacing the widely used xentissimo model. With the launch of yoximo, SIX is putting all its their trust in the latest mobile communication standards – from the mobile connection (3G) to the security certification (PCI PTS 3.x), with the latter guaranteeing long-term investment protection until 2023. A major advantage of the latest model is the new intelligent switching function, which allows the device to guarantee fast payment processes regardless of location by switching between mobile and Wi-Fi connections. Swiss consumers will soon be able to make payments using yoximo in many taxis, restaurants and retail stores. This has been in development ever since the successful pre-sale campaign started in January 2014. SIX will be sending out the first yoximo terminals to all of its customers today.